Bright, naturally white teeth are a key component in a beautiful smile. But the opposite is also true: nothing diminishes an otherwise attractive smile more than stained or discolored teeth. 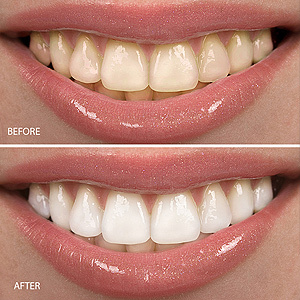 There is good news, however, about tooth staining: it can be greatly reduced with the right whitening technique. But before taking action we need to first uncover the cause for the staining — whether from the outside or inside of the tooth, or a combination of both. If it’s an external cause — known as extrinsic staining — our diet is usually the source. Foods and beverages that contain tannins, like red wine, coffee or tea fall in this category, as do foods with pigments called carotenes as found in carrots and oranges. Besides limiting consumption of stain-causing foods and maintaining daily oral hygiene, you can also diminish extrinsic staining with a bleaching application. There are two basic ways to approach this: with either a professional application at our office or with a home kit purchased at a pharmacy or retail store. Although both types use similar chemicals, the professional application is usually stronger and the whitening effect is obtained quicker and may last longer. Discoloration can also occur within a tooth, known as intrinsic staining, and for various reasons. It can occur during tooth development, as with childhood overexposure to fluoride or from the antibiotic tetracycline. Poor development of enamel or dentin (the main sources of natural tooth color), tooth decay, root canal treatments or trauma are also common causes of intrinsic discoloration. There are techniques to reduce the effects of intrinsic staining, such as placing a bleaching agent inside the tooth following a root canal treatment. In some cases, the best approach may be to restore the tooth with a crown or porcelain veneer. The latter choice is a thin layer of dental material that is permanently bonded to the outer, visible portion of the tooth: it’s life-like color and appearance covers the discoloration, effectively renewing the person’s smile. If you’ve been embarrassed by stained teeth, visit us for a complete examination. We’ll recommend the right course of action to turn your dull smile into a bright, attractive one.